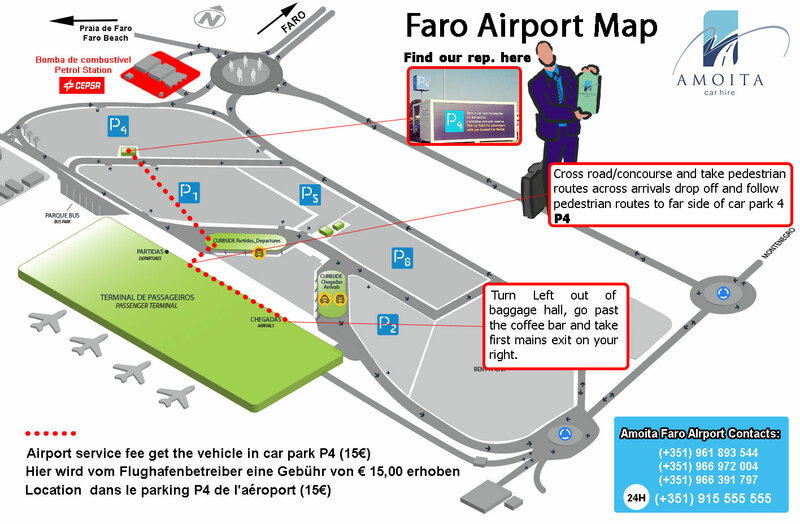 In this map you will find indications where to meet our Reps in Faro International Airport. After passing the arrivals gate turn left and follow the hallway in the departures direction till you find the ground floor bar (Faro Airport Café). We'll be waiting close to the Information Desk holding a clipboard with your name. In case you don't find us please dial (+351) 966597506. In this map you will find indications where to meet our Reps in Lisbon International Airport (Terminal 1). After passing the arrivals gate simply look ahead. We'll be waiting down holding a clipboard with your name. In case you don't find us please dial (+351) 962506497. In this map you will find indications where to meet our Reps in Oporto International Airport. After passing the arrivals gate simply look ahead. We'll be waiting holding a clipboard with your name. In case you don't find us please dial (+351) 919704067. In this map we show the most relevant Motorways in Portugal. Please note most of these roads are toll, so you'll need to take a ticked upon entrance and show it at the exit and pay the journey. Also note "Via Verde" is the line only for vehicles equiped with the automatic payment system which is not applied to our rental cars. This map shows the most usefull Algarve roads from East to West. The EN125 is an alternative to the Motorway A22, and both give access to roads to Lisbon which start in Albufeira/Ferreiras and are designated for IC1 and A2. The Motorway A2 is a Toll road as well as the A22. This Lisbon Map only shows a wide view of the urban city morphology and it's most important roads. You can find the bridges and the Airport accesses and 2nd Circular. To navigate in Lisbon we strongly recommend the use of a GPS. This Oporto Map only shows a wide view of the urban city morphology and it's most important roads. You can find the bridges accesses and Circunvalação Road. To navigate in Oporto we strongly recommend the use of a GPS. The municipality of S. Bras de Alportel is one of the widest of the Algarve with lots of roads and villages. We only show in this map the downtown where you can see our Head Office, the Market, the main strip and our cars for sale Showroom.